Alonso Campos of Wauseon with a header Monday in a Division II district semifinal versus Maumee. The Indians saw their season end with a 6-1 loss to the Panthers. 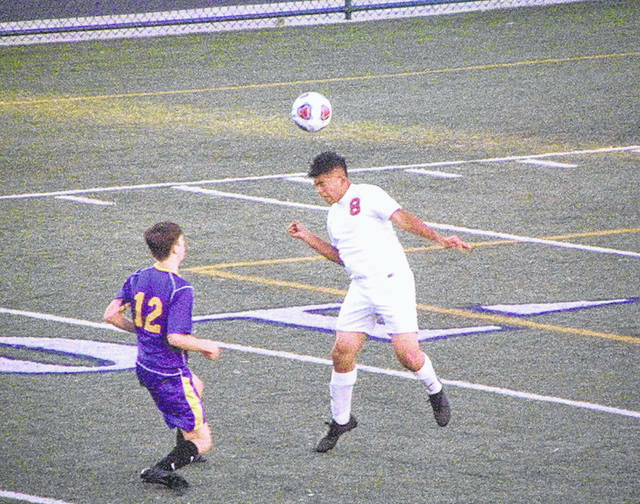 MILLBURY – It was the one thing the Wauseon boys soccer team could not have happen. Playing in a Division II district semifinal Monday at Lake against Maumee, the Panthers came out and scored three times in the first 10 minutes of the match and they went on to eliminate the Indians 6-1. Maumee came out and scored on its first shot of the game just one minute into the match. By the time Kyle Robinson scored a pair of goals, including a fantastic top-shelf shot with a pair of Wauseon defenders on him, Maumee had a 3-0 lead with 31:46 still to play in the first half. “Every game, our first 20 (minutes) is the most important because we aren’t the highest scoring team,” admitted Wauseon coach Casey Elson. “We can’t do a shootout with this team, but we could keep it (the score) low and keep ourselves in the game. The Panthers added a goal off a corner kick and one on a cross to make it 5-0 by halftime. Maumee had 17 shots on goal to two for Wauseon at the half. Braden Wagener finished his hat trick when he scored on an open net in the second half. Wauseon keeper Easton Delgado was playing a two-on-one and slipped going for the ball. The Indians did break through with 6:21 left to go in the match. Benicio Vielma scored off a corner kick to make the final 6-1. Wauseon ended the season with a record of 3-9-6.